Find projects from your favorite companies in this all-new eBook! Several well-loved companies, including Darice, Design Master, Elmer's, Fiskars, iLovetoCreate.com, Krylon, Lion Brand Yarns, Leisure Arts, Plaid, Polyform Products, Red Heart Yarn, RIT Studio, ShurTech Brands, Simplicity and Sizzix, joined forces to bring you this amazing eBook filled with some of the best crafts out there. 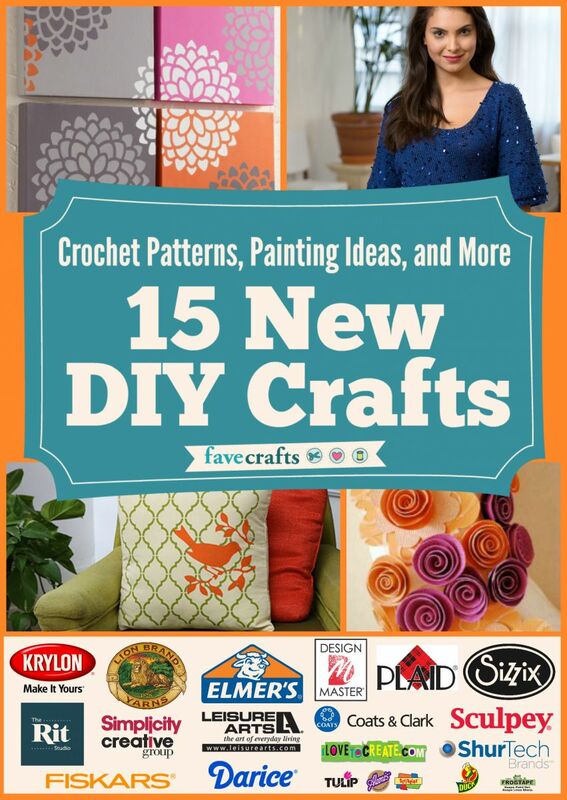 Crochet Patterns, Painting Ideas, and More: 15 New DIY Crafts is sure to be a new favorite eBook. With all the how-tos and step-by-step instructions, you'll be able to create some amazing decorations, clothes, and accessories for you or a loved one! Get your eBook today and get your craft on. Download your free of copy Crochet Patterns, Painting Ideas, and More: 15 New DIY Crafts today! We are so excited to share with you some of the best craft projects around from some of your favorite brands. Whether you are a crochet enthusiast, amateur painter, or jewelry aficionado, this book has something for every crafter. Coats and Clark, Darice, Design Master, Duck Tape, Elmer’s, Fiskars, iLoveToCreate, Krylon, Leisure Arts, Lion Brand Yarns, Plaid, Polyform Products, Rit Studio, Simplicity, and Sizzix have come together in this new title to get your creative juices pumping. Crochet Patterns, Painting Ideas, and More: 15 New DIY Crafts will inspire you to get creating today. The full instructions will walk you through each and every project. Just pick a craft and get started today. Candy Striped Texting Gloves (pg. 6) - These gloves from Simplicity Creative Group are not only super cute and colorful, they also allow you to text on your smartphone while you wear them. Perfectly Painted Pillow (pg. 12) - Add some simple yet special decor to your home with this craft from iLoveToCreate.com. The best of this painted pillow is that you can choose the colors of your paints to match the furniture you already have. Pretty Paper Flower Wreath (pg. 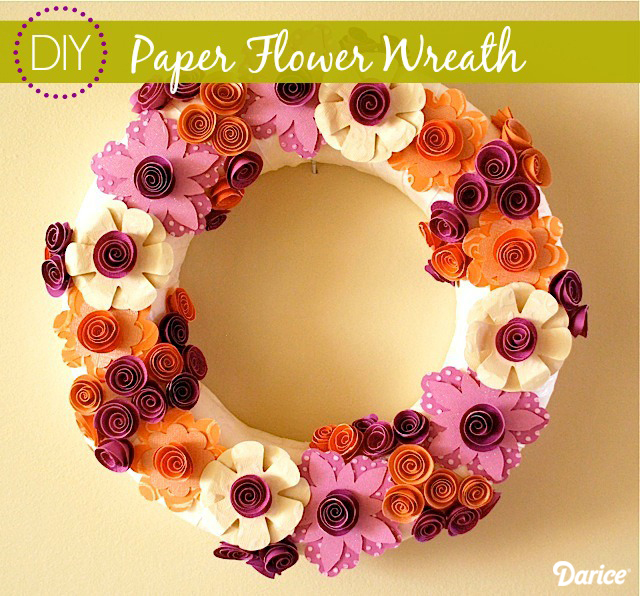 18) - Darice shares this stunning paper wreath that will definitely be a show-stopper when you hanging it in your living room, foyer, or on your front door. All Seasons Crocheted Drink Cozies (pg. 26) - No one likes it when the condensation from their drink gets their hand wet or cold. Make these cozies from Leisure Arts, and you will never have that problem again. Blooming Wall Art (pg. 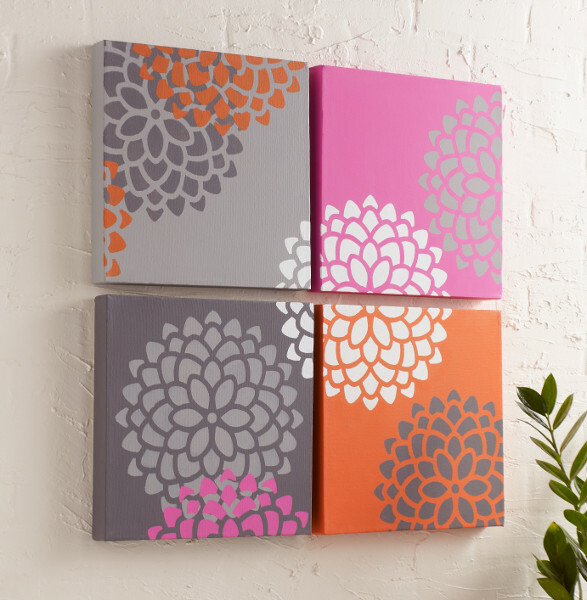 35) - This DIY wall art will add a pop of color to any room. Plaid shows you how to create this eye-catching decoration that is sure to delight you and your family. Wood Veneer Wrapped Candle (pg. 50) - Make regularly dull candles much more decorative with this fun and easy DIY project. Organizing Hanging Boxes (pg. 53) - Tired of losing things in the bathroom or bedroom? Get orgainzed with these fun and functional boxes from Duck Tape Brand. Sassy Striped Crocheted Headband (pg. 58) - This hair accessory from Lion Brand Yarn is perfect for any little lady in your life. Make this awesome gift for your favorite daughter, niece, or granddaugther. Wardrobe Organizer (pg. 69) - Take the stress out of your mornings by planning your week's outfits with this handy organizer from Krylon. Filled with lots of great projects for crafters of all mediums, this free eBook is a great way to expand your crafting skills and fuel your creativity. With lots of great projects from some of the best companies in the market today, Crochet Patterns, Painting Ideas, and More: 15 New DIY Crafts is sure to keep you busy the whole year through!